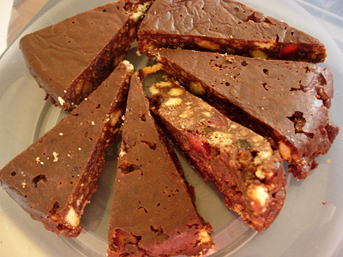 With all the delicious desserts that have preceded this post I felt it was time to get back to something more staple what better way to do that than a Chocolate Tiffin Cake full of delicious ingredients such as Biscuit,Cherries,fruit and of course Chocolate what a combination. This combination would grace any lunch box especially in today's economic times this Tiffin cake will give you the energy and lift you at any time of the day to carry out your daily tasks and even make you happier in those tasks hopefully. Give a try and please let me know. Melt the butter syrup and chocolate together in a saucepan (or in a microwave on medium setting). Stir in the next five ingredients and combine well. Pour the mixture into a lightly buttered 24cm round cake tin. Once cold place in the refrigerator overnight or for at least 4 hours. To serve cut into thin wedges and serve with some pounog cream or ice cream. You can use toasted hazelnuts or unsalted pistachios instead of the walnuts and dried apricots pear or mango instead of the cherries. You can also make it even richer by topping with a thin layer of melted chocolate. Remember to serve in thin slices unless you belong to the Death by Chocolate brigade like me of course. During World War II the U.S. government recognized chocolate's role in the Allied Armed Forces. It allocated valuable shipping space for the importation of cocoa beans.Today, the British Army standard ration pack includes 2 chocolate bars. I love chocolate. Great recipe! thanks for your comment and thanks for following me. Yes I surely am crazier about chocolate than you are.Glad you like the fact. Thanks for your interest in my blog. As chocoholics we stand together.